Kaganovich, Lazar [Kaganovič], b 22 November 1893 in Kabany, Kyiv county, Kyiv gubernia, d 25 July 1991 in Moscow. (Photo: Lazar Kaganovich.) Bolshevik and Soviet political leader of Jewish descent. Joining the Bolshevik party in 1911, he organized trade unions in various towns of Ukraine. During the revolutionary period he held important Party posts in Belarus (1917), Russia (1918–20), and Turkestan (1920–1). Transferred to Moscow, he worked in the central agencies of the Russian Communist Party (Bolshevik) (CP[B]). By 1925 he became a member of the CC CP(B), and by 1930 a member of the Politburo. Because of his unconditional loyalty, Kaganovich was used by Joseph Stalin for the most repugnant and ruthless tasks. As first secretary of the Central Committee of the Communist Party (Bolshevik) of Ukraine (1925–8), he was responsible for crushing Oleksander Shumsky's opposition while maintaining the appearance of Ukrainization. Upon his return to Moscow he was appointed to the Party Secretariat, where he had a decisive influence on Ukrainian affairs. 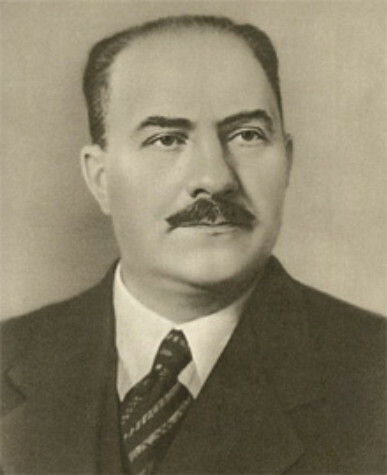 In 1933, as director of the agricultural department of the CC of the All-Union CP(B) (see Communist Party of the Soviet Union), he set up the political departments of the machine-tractor stations and helped Viacheslav Molotov organize the forced collectivization of Ukraine by terror and famine (see Famine-Genocide of 1932–3). From 1935 to 1944 Kaganovich held various government posts in Moscow. In 1947, he was again appointed first secretary of the CC CP(B)U and was assigned the task of pacifying Ukraine. After Stalin's death in 1953, he rose to first deputy premier of the USSR and member of the Presidium, but four years later lost all his government and Party posts, and even his Party membership, for participating in an abortive attempt to oust Nikita Khrushchev from power. He was later rehabilitated.